Nearly $35,000 Raised on #GivingTuesday! 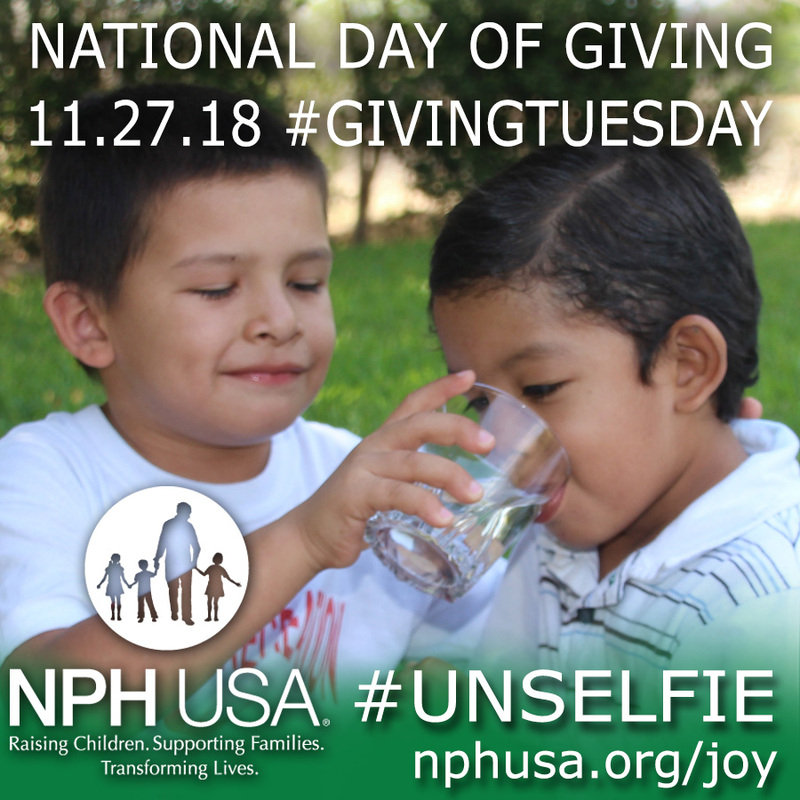 On November 27, 2018 – the Tuesday after Thanksgiving – NPH USA was again be part of the #Giving Tuesday Movement. 11/28/2018 UPDATE: THANK YOU SO MUCH to everyone who participated in Giving Tuesday! You helped us raise nearly $35,000! And this number doesn’t include the multiple open fundraisers being hosted through personal Facebook pages nor the support we received to our regional offices via mail! We are incredibly grateful for ALL of your support. TOGETHER, we are raising children, supporting families, and truly transforming lives. On behalf of the 6,200+ children we support, THANK YOU to everyone who participated by making a donation, and sharing our posts and emails! NPH USA is pleased to announce it has again joined #GivingTuesday. Occurring this year on November 27, #GivingTuesday is held annually on the Tuesday after Thanksgiving (in the U.S.) and the widely recognized shopping events Black Friday and Cyber Monday to kick off the holiday giving season. The goal is to inspire people to take collaborative action to improve their local communities and give in impactful ways to the charities and causes they support, and help create a better world. In 2017, the sixth year of #GivingTuesday, millions of people around the world came together to give back and support the causes they believe in. Over $300 million was raised online to benefit a tremendously broad range of organizations, and much more was given in volunteer hours, donations of food and clothing, and acts of kindness. NPH USA is grateful to the 97 donors who gave nearly $38,000 in 2017. That is more than the first five years of Giving Tuesday combined. We need your help to increase that this year, and invite you to help give joy to the thousands of vulnerable children we support. On #GivingTuesday, Facebook is partnering with PayPal to match up to $7 million in donations made on Facebook to eligible US-based 501(c)(3) nonprofits! The match applies to fundraisers for nonprofit organizations, including birthday fundraisers and Donate buttons. Fundraisers for personal causes aren’t eligible to receive the match. The matching dollars are available to any US-based nonprofit that can receive donations made on Facebook. If you’re located outside the United States and want to fundraise for an eligible US-based nonprofit, donations to your fundraiser are eligible to be matched. Donations up to $250,000 per nonprofit and $20,000 per donor are eligible to be matched. Facebook and PayPal will match donations starting at 5:00 a.m. Pacific Standard Time (PST) on November 27 and continue matching donations to nonprofits until the $7 million match runs out. Additionally, Facebook is waiving all fees for donations to nonprofits on #GivingTuesday. Please note that gifts made before 5:00 a.m. PST/8:00 EST on November 27, 2018 will NOT be eligible for the match. Use our avatars and Facebook cover and link to www.nphusa.org/joy. NPH USA, Federal Tax ID# 65-1229309, is a registered 501(c)(3) nonprofit corporation. Contributions are tax deductible as provided by law. An audited financial statement is available here.